Introduced in the Fall of 2017, our advanced recreational diving program is for athletes who have successfully completed our Learn to Dive Program and earned their gold medal. 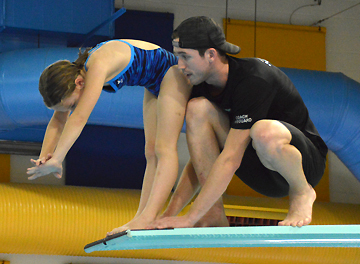 This program is tailored to athletes who would like to continue advancing in the sport of diving in a non-competitive setting or who may require additional time to learn the skills necessary for the competitive stream. A bridge to the pre-competitive stream of diving. A pathway that allows athletes to stay in the sport of diving without the pressures of competition. The opportunity for our older athletes to given instruction on how to teach future learn to dive classes. This instruction will be given by an NCCP certified facilitator and once the requirements are completed, the participants will be certified instructors.